A healthy Easter dessert your kids will love to eat and help you make! 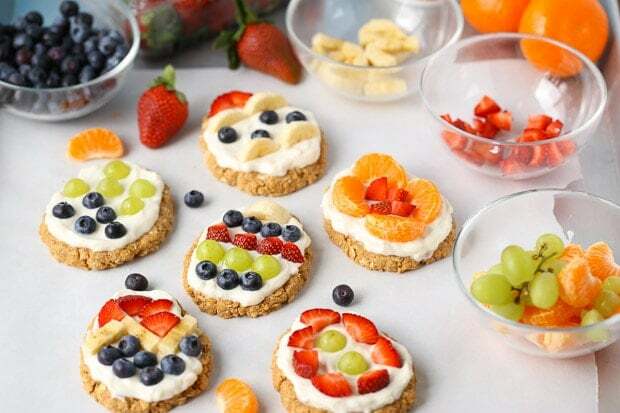 Decorate these No-Bake Easter Egg Fruit Tarts with your kids this holiday season. Spring has sprung! Okay, okay there is still snow in the mountains but I’m out wearing florals and sandals! Easter is coming up fast and that means it’s time for the bunny to fill those baskets and to bring some Easter cheer to your home. 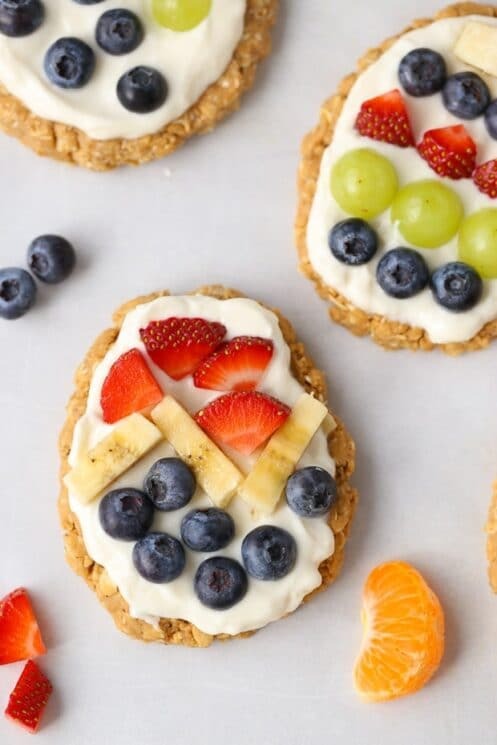 Start by making these adorable No-Bake Easter Egg Fruit Tarts! Let’s get started! 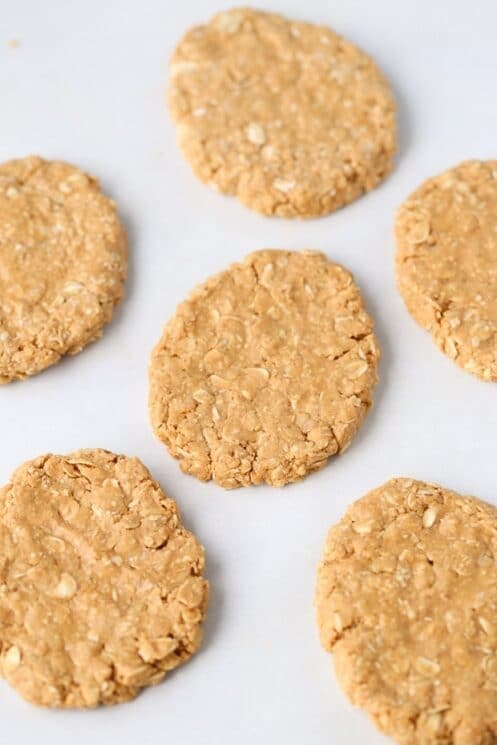 The crust is a combination of almond butter, honey, oats, homemade oat flour and a little vanilla! Once the crust sticks together when you grab a fistful (and it doesn’t actually stick to your hand) you’re ready to go! Form little Easter eggs! You can do one big one, a bunch of tiny ones or a few medium sized. Give your kids some crust and let them create whatever they want. I put mine on parchment paper to minimize the cleanup when I was done. 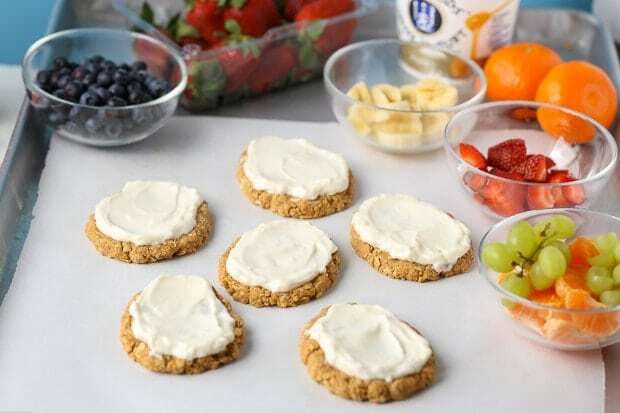 Next, spoon on a little greek yogurt and spread it around like you’re frosting a cookie or spreading sauce on a pizza. 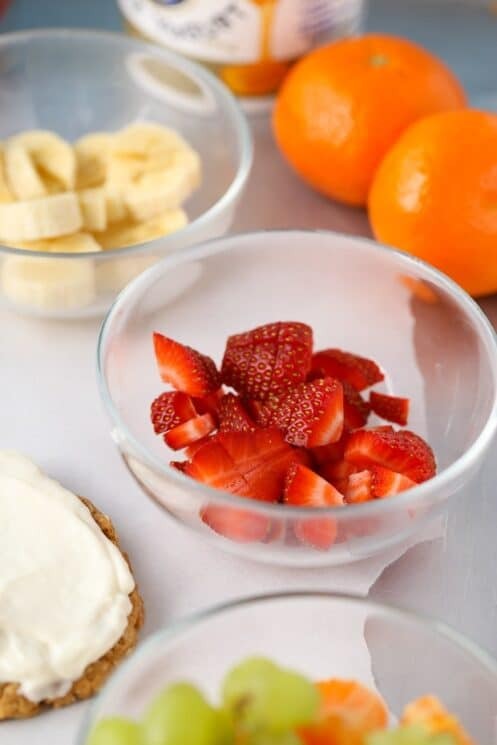 Chop up plenty of fruit so the kids can decorate their “eggs” with all sorts of colors and then let them decorate! 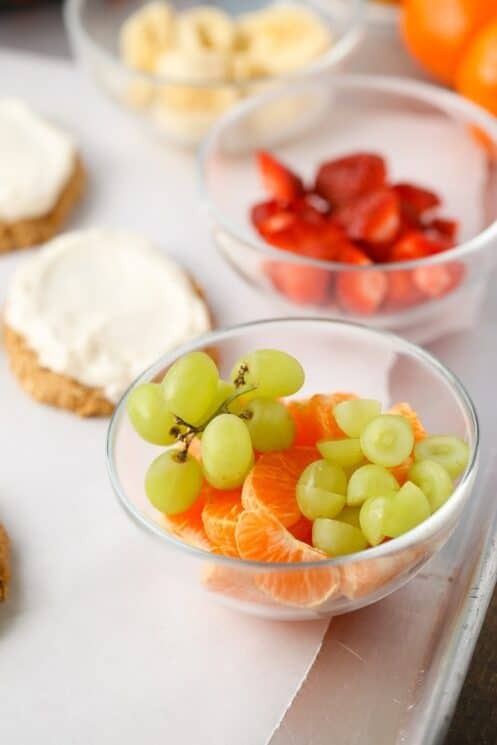 You can even snack on the fruit as you go! My favorite egg was this little patriotic one I made! Remember, we formed the crust to look like Easter Eggs but you don’t have to do that! If it’s Christmas time you could make a tree shape and decorate it with green and red fruit! Or even just press this into a tart pan and bring it to a potluck this summer! This recipe is so wonderful because you can make it perfect for any occasion! Happy Easter! 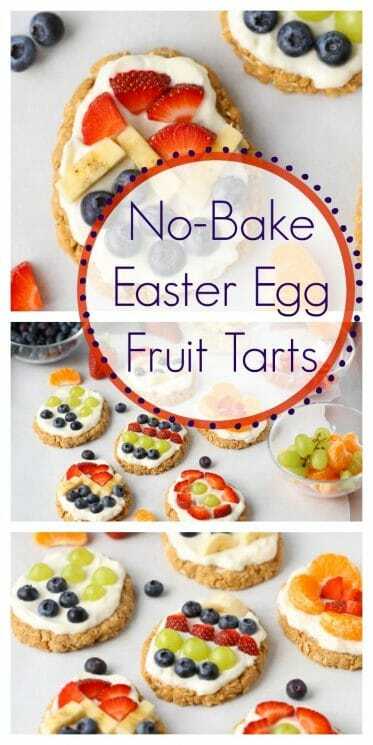 Enjoy our No-Bake Easter Egg Fruit Tarts! 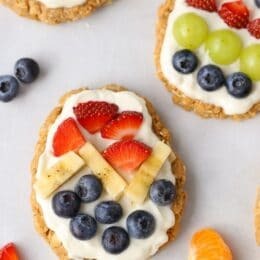 These look so tasty, I will be giving these a go over the easter break with my little legs, she will fun making these. I made these for Easter first and they were great! 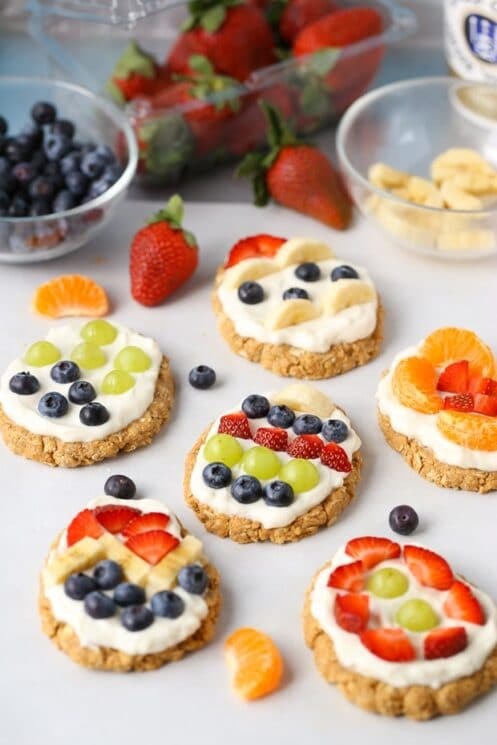 So second time around I made them into little cups by putting them in a muffin tin, then in the fridge over night, then put the yogurt and fruit! Just as delicious as the first time! Thank you for this healthy, yummy recipe! Ok I know it seems like I’m in the wrong season but we actually made these with a Christmas theme instead. We kept the same shape and my kids made Santa faces. They turned out great. Thanks for the great idea for Easter AND Christmas! Wow these look great! Could I use maple syrup in place of honey? Thanks! Hi Nicole! I’m not sure if maple syrup would work in this recipe, because it’s less sticky and therefore has less binding power to hold the tarts together. I haven’t tried it though, so it might… if you decide to experiment, please let us know how it turns out! Do you think almond milk yogurt would work or not be thick enough? My little one has a dairy allergy. Hi Rachel! I think it would depend on the brand of the yogurt. If it’s very thick, like Greek yogurt, I think it would be fine. If the texture seems too runny, you could try adding a pinch of corn starch to make it a little more stiff. Does anyone know how long the un decorated “eggs” can be kept? should they be refrigerated? Hi Claire! I would refrigerate the “eggs” and expect them to stay fresh for about 4-7 days. Could I just use flour instead of putting oats in the blender?